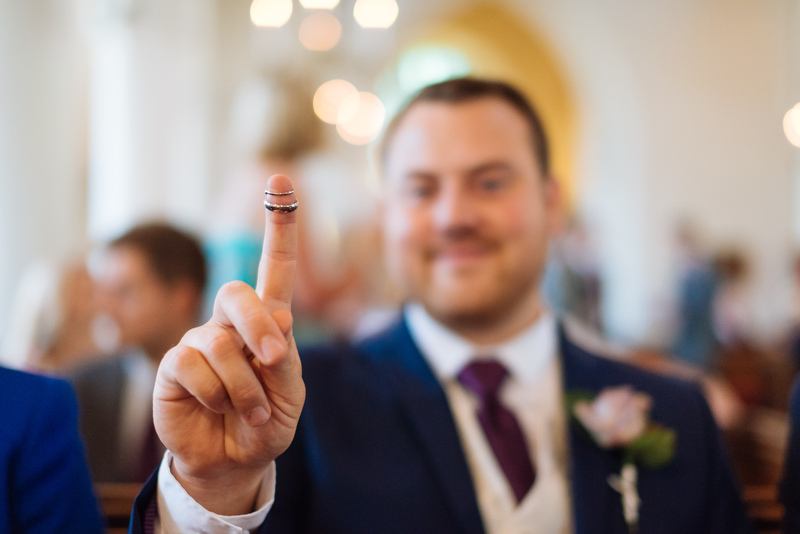 This was my first time photographing at Stokes Farm Barn in Wokingham, where Rob and Emma held their reception following on from their ceremony at St Andrew’s Church in Sonning. 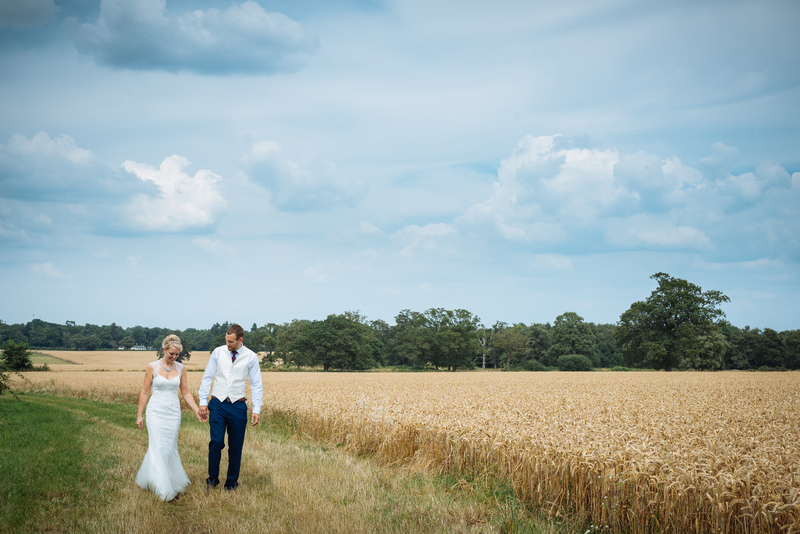 They had a perfect July day for their Wokingham wedding with glorious sunshine all day. They were up for anything photo wise, with plenty of ideas of their own! 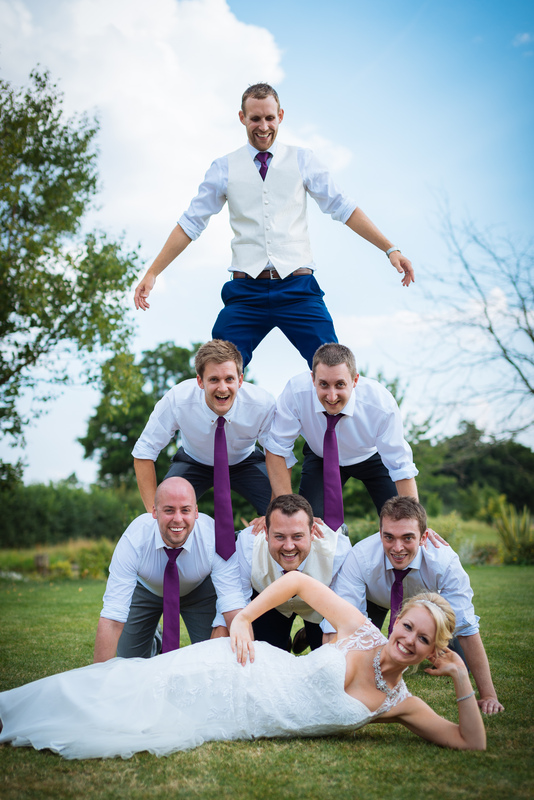 Their extensive bridal party were great fun too. 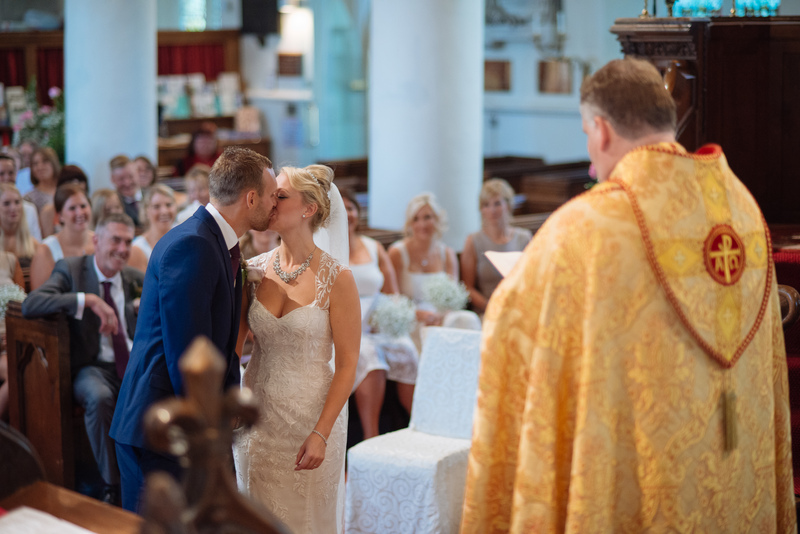 St Andrew’s Church in Sonning is a lovely little church, with Rob and his best man arriving early they had plenty of time to relax before the wedding ceremony and have a little fun with the wedding photography. 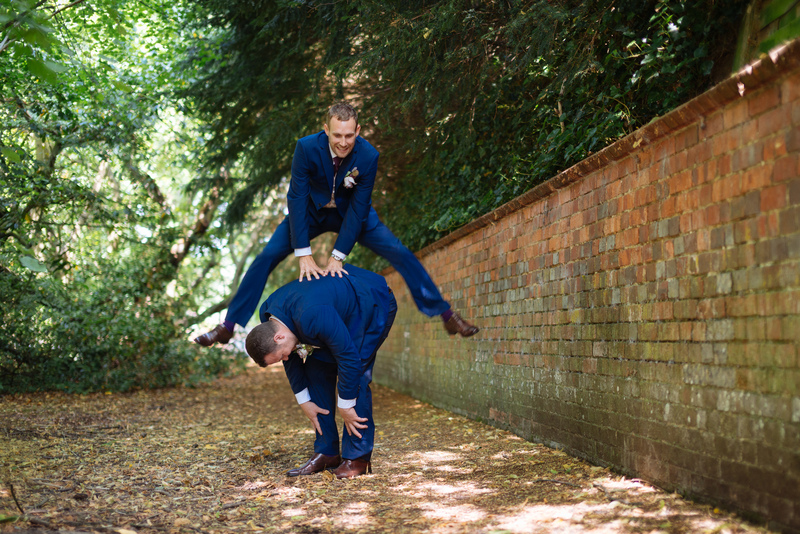 Rob leapfrogs over his best man while killing time before his wedding! Keeping the rings safe? Check. 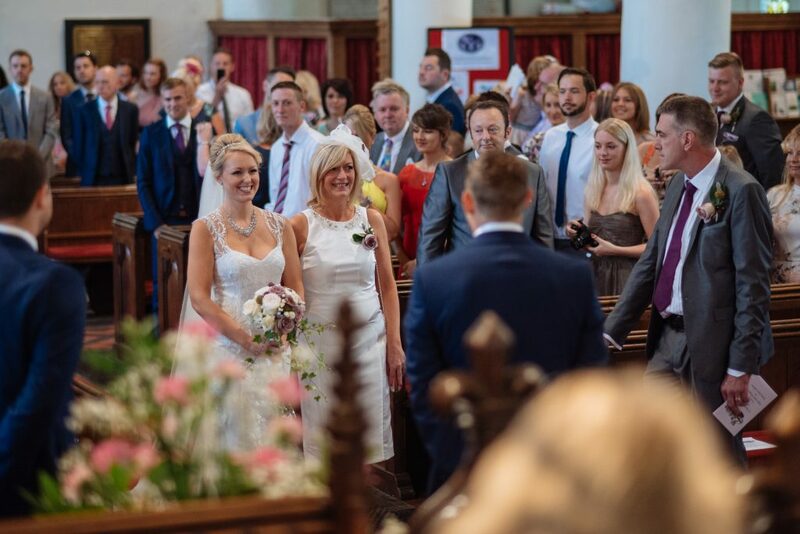 Emma and Rob catch their first glance of one another as she walks down the aisle. 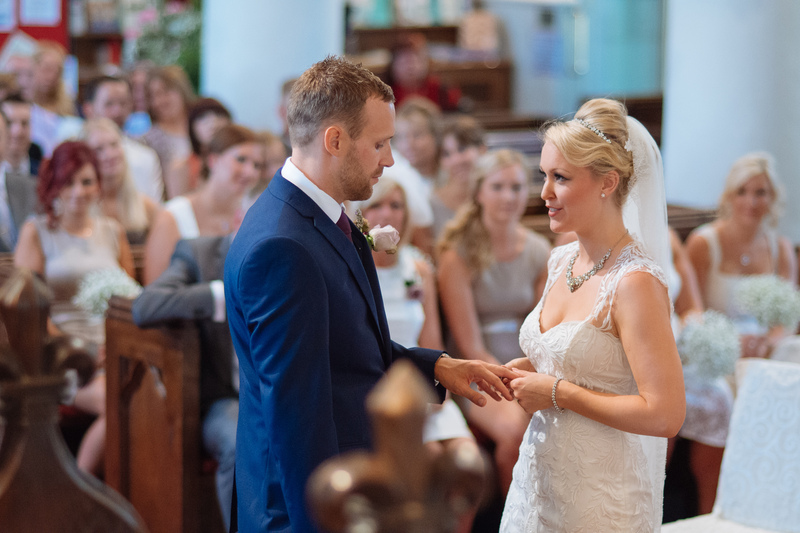 Exchanging of rings during the wedding ceremony. 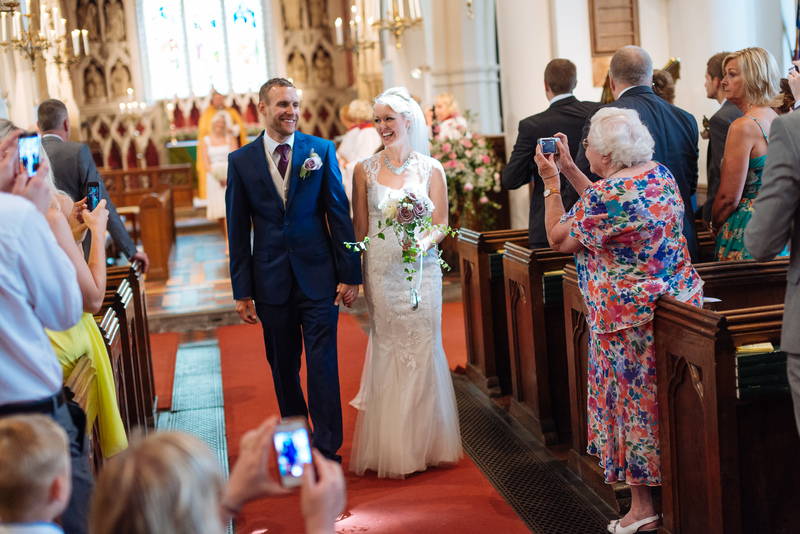 The newlyweds as they walk down the aisle of St Andrew’s Church. 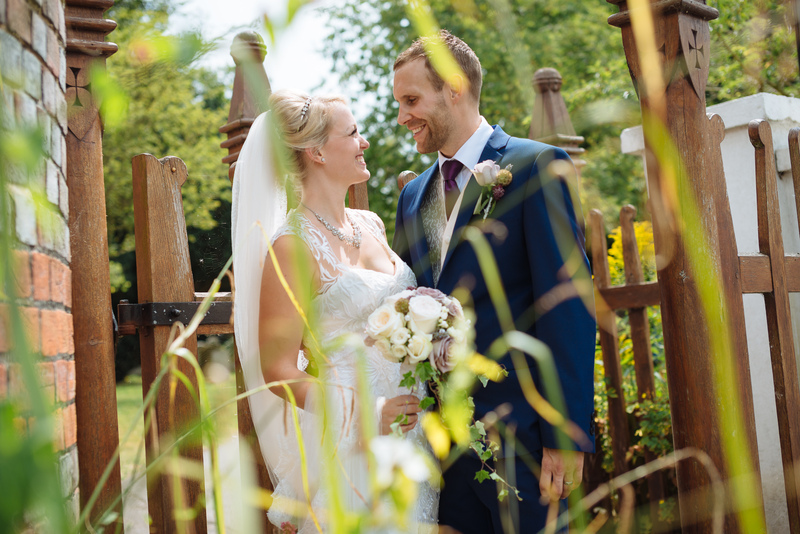 We took the opportunity to shoot some photos in Sonning Village before moving on to the reception in Wokingham. It’s a beautiful village on the River Thames so we just had to make the most of the incredible setting and weather. Hooray! 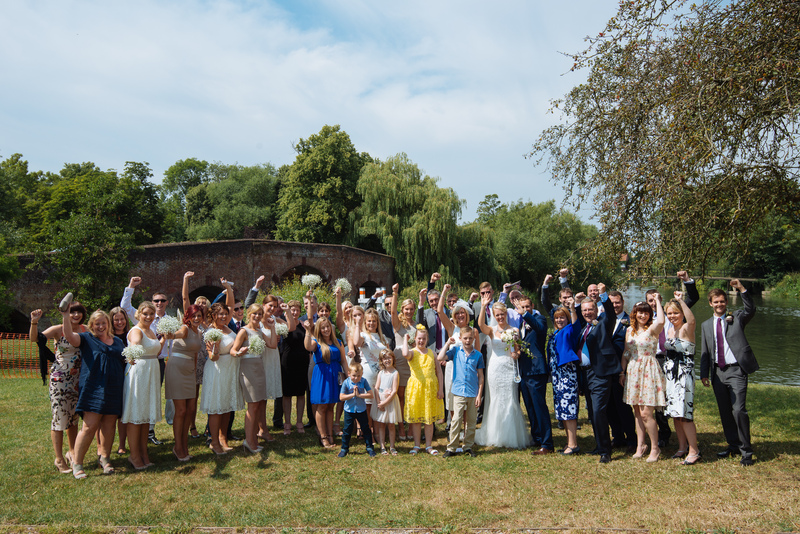 The wedding party at Sonning Bridge on a beautiful summer day. 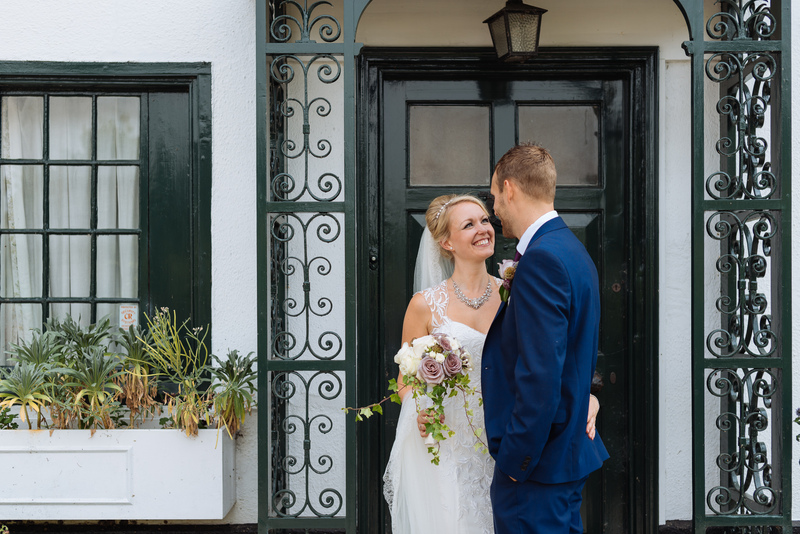 All smiles at the gates of St Andrew’s Church. 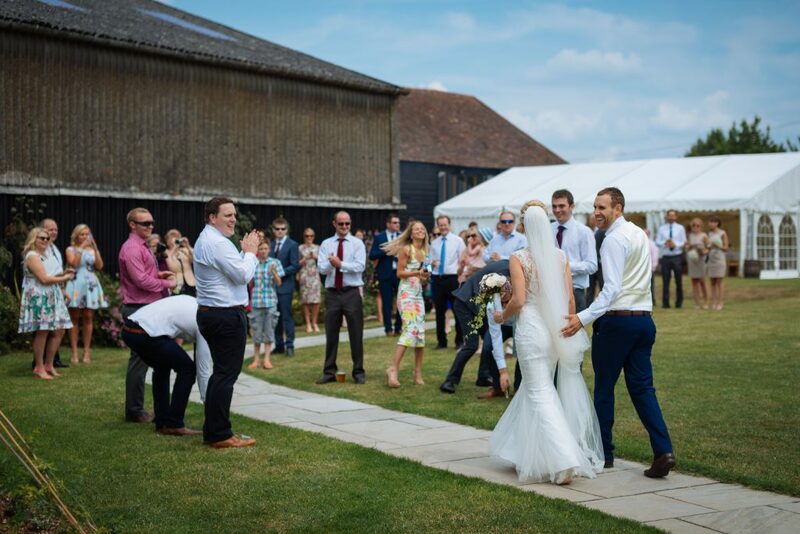 Rob and Emma’s Wokingham wedding reception was held at Stokes Farm Barn. 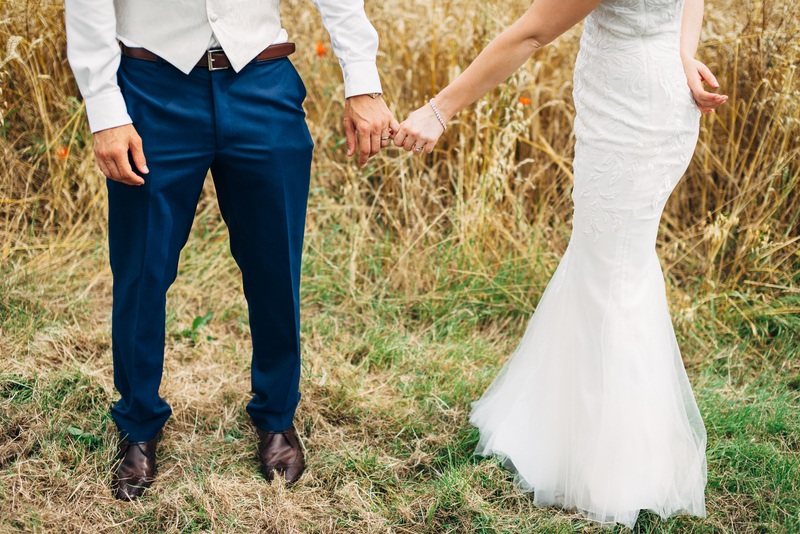 It’s a beautiful setting that’s incredibly rural considering that it’s just a few minutes from Wokingham town centre. They really put their own stamp on the day and their friends and family were really great fun and clearly so supportive of them. It certainly shows in the photos! Rob and Emma arrive at their wedding reception at Stokes Farm Barn in Wokingham. 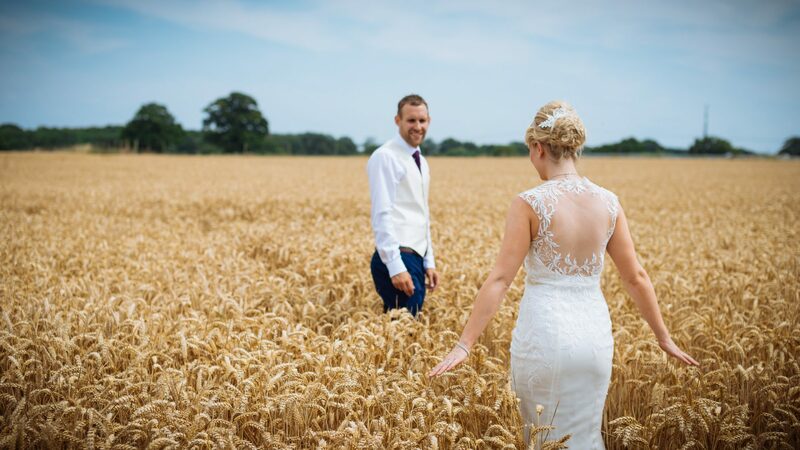 Walking the wheat fields of Wokingham. Sharing a tender kiss during a moment of quiet. Rob’s band of merry men couldn’t resist but get involved! 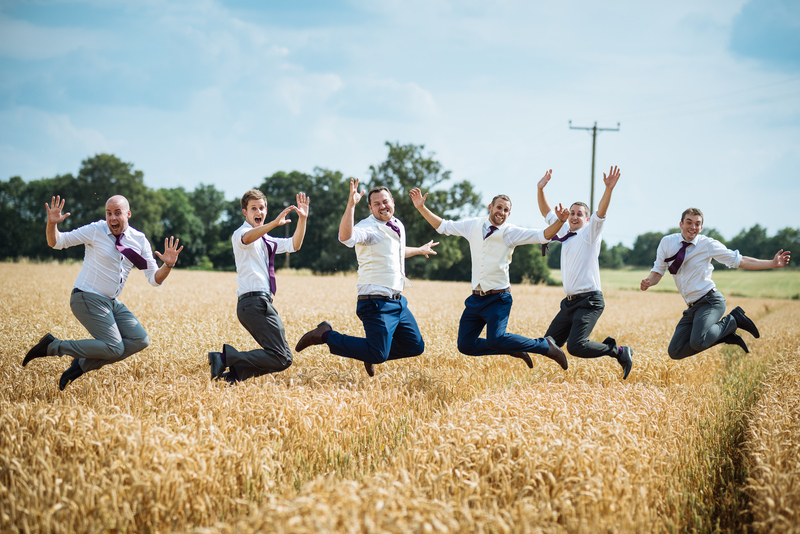 Something tells me the bridal party are a little bit excited! It’s fair to say that Rob’s mates really support him.